Workers remodeling one of Petersburg’s oldest buildings have uncovered Norwegian artifacts dating back a century. The items are linked to some of the town’s earliest Norwegian settlers. And one woman in town is helping to make sure these treasures are preserved for future generations. This leather bound notebook and knife holder were found under the floor of the men’s bathroom upstairs during remodeling. Photo courtesy of Jill Williams. 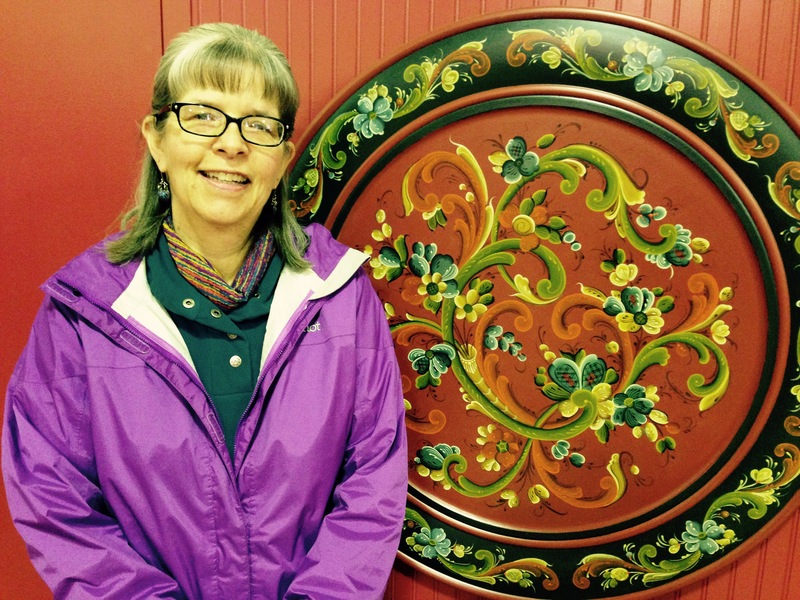 Jill Williams is in her early 60s, but she’s drawn to objects before her time. When she walks me through Petersburg’s Sons of Norway hall she feels right at home. The large barn-like building was built on the waterfront in 1912. The original parts and pieces are Williams’ favorite. On the outside, the hall is white with a red roof and trim and traditional flowery rose mauling designs on the window frames. It remains Petersburg’s largest gathering place. Countless conferences, weddings — even funerals — have been held here. Williams has been a member of Petersburg’s Sons of Norway lodge for over 40 years. Her grandparents came from Norway. So when she found out that the carpenters working on the hall had found artifacts in the walls and floor she was pretty excited. 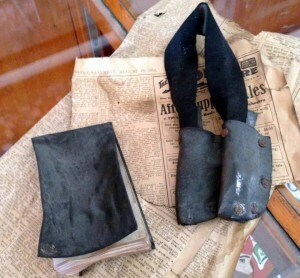 Workers found a rough-cut board with Norwegian writing on it, an old inkwell, an old leather bound notepad, and a leather pouch for holding a few knives, as well as empty beer bottles. 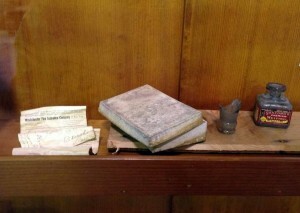 The artifacts are now on display in a glass case near the hall’s entrance. 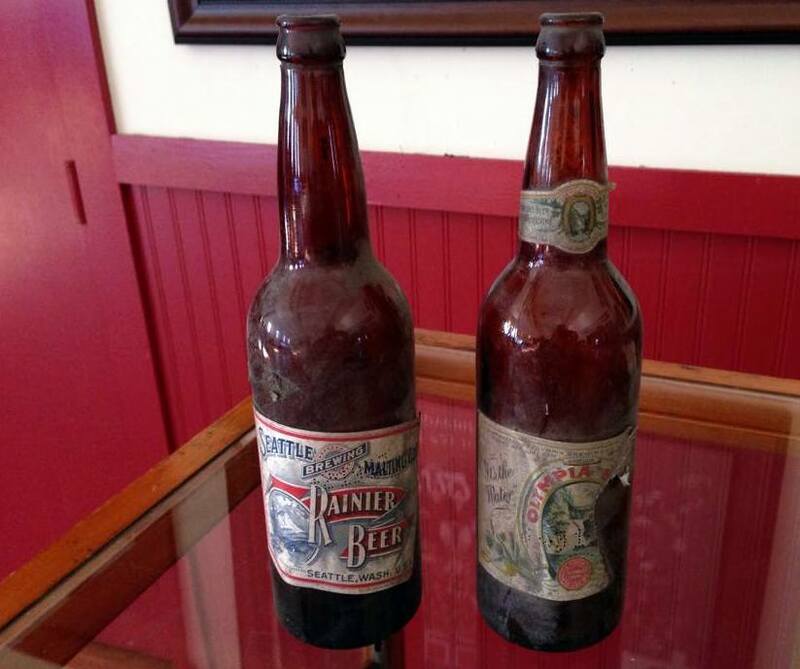 These beer bottles were found in the walls of the Sons of Norway Hall during remodeling. The labels are dated 1906. Photo courtesy of Jill Williams. The beer bottles are made of thick glass, and they’re nearly as tall as modern-day wine bottles. “What was really cool is one has a Ranier label and the other one has an Olympia label,” she says. The labels are from 1906. The bottles are now in a display case at the Sons of Norway building. The casual drink-and-drop by some of the building’s early Norwegian occupants is creating an exciting hub-bub a century later. Williams’ interest in preserving Petersburg’s history goes beyond the walls of the hall. We head up the stairs. Upstairs there are several rooms with various kinds of furniture. Most of it has been replaced over the decades. In a nearby dark storage room Williams leans under a slanted ceiling where she finds an original: It’s a beat-up old chair that’s losing its stuffing. She runs her hand over its back. “Poor old chair, but that must have been one of the chairs that those ladies sat in… and relaxed…” Williams says. 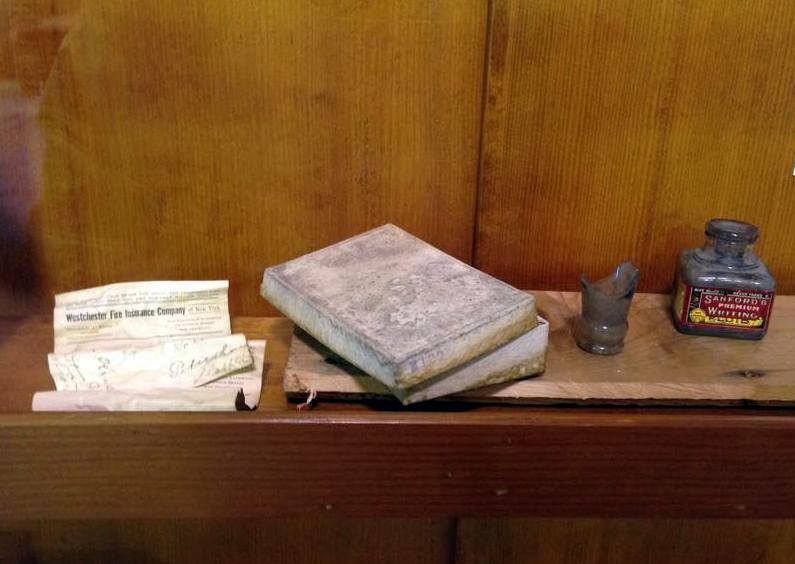 This inkwell and other items were found in a space behind the women’s bathroom upstairs at the Sons of Norway Hall. Photo courtesy of Jill Williams. The history here isn’t just about the objects — it’s about the people who used them. Like the person who wrote in Norwegian on the board that was found in the wall back in 1912? His name was Hans Wick (pronounced Vick). Through research Williams found out Wick had come to Petersburg in 1908 and quickly became an involved community member. He was the town marshal, the fire chief, the health officer, and the superintendent of public works. So what did he write on the board? The exact meaning of Hans Wick’s message might never be known. But that’s OK with Williams. She’s fine with just appreciating the new artifacts as a link to the town’s Norwegian history.